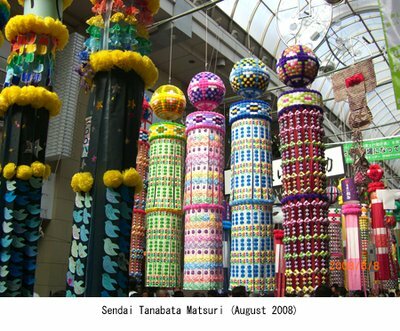 The Japanese American National Museum will host a tanabata ornament-making workshop on June 20, 2009. The workshop is a ‘pre-celebration’ of sorts for the Nisei Week Japanese Festival—part of a project that aims to decorate the streets of Little Tokyo in preparation for the Japanese American community’s annual summer event. With the involvement of Yoshihito Yonezawa—chairman of the Nanka Miyagi Kenjinkai (Miyagi Prefectural Association of Southern California), detailed plans are currently being drawn out in order to bring this project to life. Miyagi prefecture’s Sendai City is famous for its extravagant tanabata matsuri (festival), and is hailed as one of the “Big Three Festivals” in Northeast Japan with over 2 million visitors attending annually. For several years, it has been Yonezawa-san’s dream to see a tanabata festival—the pride of his hometown—in Los Angeles. The 2007 Nisei Week Festival produced quite a buzz with Aomori’s Nebuta matsuri theme, but it seems that tanabata will be the talk of the town this summer. Tanabata originates from a Chinese folklore—the “Story of the Cowherd and Weaver Girl” —as well as from Kikouten (“Qi Xi” in Chinese, or “The Festival to Plead for Skills” ), which is a festival based on this story. The tradition was carried over to Japan, and is believed to have merged with the Japanese legend of Tanabatatsume , leading to the birth of Tanabata. In the Edo period, the event was given the alternate name of Take-no-sekku and introduced as one of the five seasonal-celebrations of Japan, along with Momo-no-sekku (Girl’s Day) and Tango-no-sekku (Boy’s Day). Tanabata celebrates the meeting of Orihime (Vega) and Hikoboshi (Altair), two lovers (stars) that are separated by the “Heavenly River” (the Milky Way) and are allowed to meet only once a year, on July 7th. Several events and festivals have come to life through this story, but none bigger than the tradition of hanging tanzaku (strips of paper with wishes written on them) on bamboo branches, decorating windowsills and front doors. In many cities, the local shopping promenades have adopted these decorations to signify their hopes for prosperous business. Tanabata in Sendai first began in the early Edo period. It is said that the then-leader of Sendai, Masamune Date, had promoted tanabata as an annual event in hopes of fostering greater cultural awareness among the women in the city; however, the details of its origins remain unknown. Nowadays, the event is held one month later, starting on August 6th. For three days, over 3000 tanabata-themed decorations saturate the town, with the major decorations covering the shopping promenade. Numerous parades, concerts, and food and merchandise stands liven up the celebration. Yonezawa-san is from Kami-machi (the former Nakaniida-machi) city in Miyagi prefecture, and came to the United States as a 26 year old in 1956 to help his uncle, a farmer in the Imperial Valley. Over a half-century has passed since then, but he still holds strong feelings toward his hometown, and with a desire to “do something for the Miyagi prefecture,” he has involved himself with many volunteer opportunities as the chairman of the Nanka Miyagi Kenjinkai. In regards to the tanabata festival, when the Nanka Miyagi Kenjinkai celebrated its 100th anniversary in 2002, he livened up the event by decorating the (then) New Otani Hotel lobby with ten “fukinagashi” ornaments, which were sent as a gift from Ichiro Shiramatsu, president of Sendai’s famous patisserie, Shiramatsu-ga-Monaka Honpo. Records of tanabata festivals being held in the US are sparse. Perhaps the only known account is in Philadelphia, where tanabata decorations were put up some time ago—but no one seems to even know when or why it had happened. There once was talk in Riverside, California—the sister city of Sendai—to decorate the city with tanabata ornaments, but the idea never materialized. 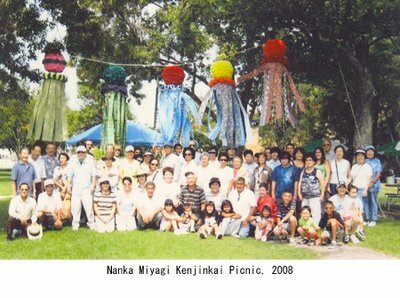 Recently, the Miyagi Kenjinkai put up some tanabata decorations for a picnic at a park in Monterey Park. It was sparked by a suggestion from Yoko Nishimura, coordinator of the Japanese American National Museum’s “Discover Nikkei” project, who experienced a tanabata festival in São Paulo upon her visit to Brazil three years ago, and told Yonezawa-san that there ought to be one “in Los Angeles, too.” The following year, a few affiliates from Miyagi happened to come to Los Angeles for an International Rotary Club event, so with their help, five fukinagashi decorations were made, and were put on display at the picnic. This became somewhat of an unexpected hit at the event, and the decorations began to be used for several occasions—from carnivals at Higashi-Hongwanji to the annual Nanka Kenjinkai Kyogikai (Japanese Prefectural Association of Southern California) Scholarship Ceremony at the Aratani Theater. The decoration was also placed in front of the Little Tokyo Koban (police station), whereupon LAPD Deputy Chief Terry Hara—who is also the head of the Nisei Week planning committee—took notice. This led to the decision to implement the tanabata theme to this year’s Nisei Week Festival. 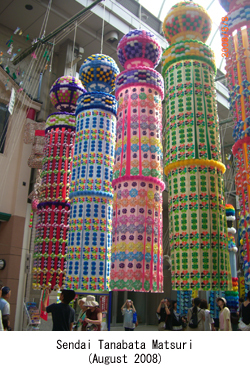 There are seven different types of ornaments that decorate the tanabata festival in Sendai. Each holds a unique meaning to it, and Yonezawa-san plans to make them all during the workshop. The seven types of ornaments are “tanzaku,” “kamigoromo,” “orizuru,” “kinchaku,” “toami,” “kuzukago,” and “fukinagashi.” Each represents something different—tanzaku wishes for educational advancement, kamigoromo for protection from illness and injury, orizuru for longevity, kinchaku for wealth and prosperity, toami for a good catch (fishing), kuzukago for cleanliness and prudence. Fukinagashi represents the strings from Orihime’s weaving yarns, and many of them are accompanied by a kusudama (floral origami globe). However, it has been suggested that 200 ornaments be made for the Nisei Week Festival, and one workshop alone will not be enough to cover all 200. Therefore, Yonezawa-san has been working with the idea of gaining cooperation from local Japanese schools—to have the students participate in the making of the ornaments. The event would be a mixture of Japanese cultural education and awareness. In addition, he’s hoping to get the elderly residents living in the Little Tokyo towers involved as well. Special paper and other material must be imported from Sendai, so funding is also an important source of support. The Nanka Kenjinkai Kyogikai has already pledged their support, and the Nisei Week Planning Committee plans to call out to similar organizations and Nikkei corporations for additional contributions. Sendai’s tanabata festival has already been “exported” to many areas of the world, including São Paulo, where it was first held in 1979. In addition to the decorations, the event began to include food stands, book sales, tanzaku sales, yukata contests, and has grown to be included in the city’s annual event calendar. In France, the festival is aptly titled “Sendai Tanabata Matsuri in Paris,” and is held with support from the Sendai Tanabata Kokusai Koryu Iinkai (Sendai Tanabata International Exchange Association), as well as a group of Sendai natives living in Paris called the “Aobakai.” The groups organize ornament-making workshops as well as other workshops for traditional arts and crafts unique to the Sendai area. This year marks the 69th anniversary of the Nisei Week Festival, and will be held from August 15th to 23rd. What kind of excitement will it bring to Little Tokyo? The anticipation for the tanabata festival is already growing. For more information about Nisei Week, go to First Los Angeles Tanabata Festival home page.